While strolling through target this afternoon I couldn't help but notice the huge silhouette of Justice league characters at the endcap. HOORRAYY!!! They finally bulldozed of that pile of TMNT and IronMan peg warmers!!! While perusing the DC/Man of Steel display I looked down and saw this HUGE figure in a target Exclusive 5 pack. 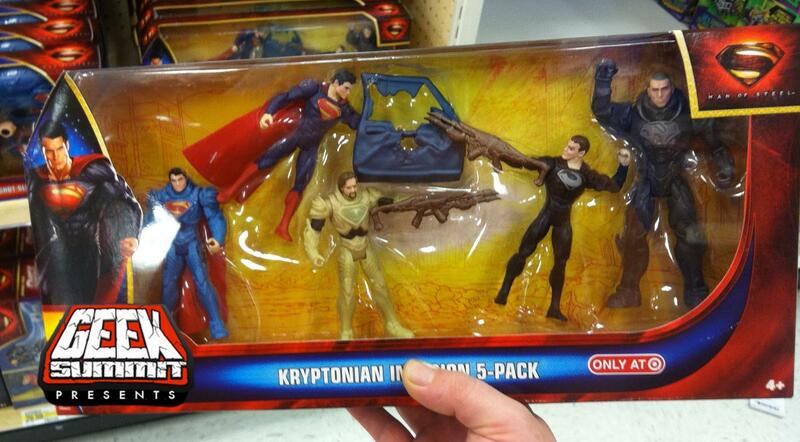 The 5-Pack includes Superman in standard presentation as well as Kryptonian Armor, Jorel in Armor, Zod, and then this King Daddy towering over the rest of the characters. Yeah probably but we'll get good stuff too. They've got to overproduce SOMETHING. NAMEK?! Get out of here DBZ! Those things make the IM 3 figures look like masterpieces, what cheap crap. It's a shame DC and Mattel can never make good 3.75 in. movie stuff. Awesome looking movie and current trailer, by the way. Actually it looks like they have elbow joints, so IM3 still beats it for the worst recent movie 3.75" releases. I don't get it. 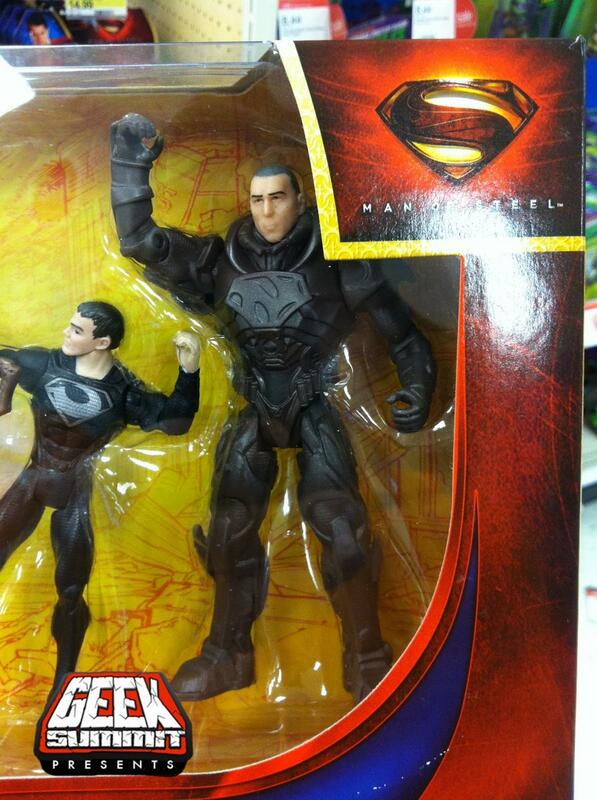 Is he suposed to be a kryptonian giant or is it some weird movie masters pack in? Ok... so he's a giant bad guy from krypton. Odd. Namek is the only one that may interest me ... BORING... Picked up a 3 3/4 fig just to see and the only cool thing is that cape is cloth.... Other than that these things are unposeable POS. these thing are the hottest things in my local area kids are buying this stuff up. price point and simplicity of the fig make this an easy sell for parents with smaller kids that only want a superman fig. u say crap and pegwarmer but i seen movie gijjoes and im3 figs are the pegwarmers. 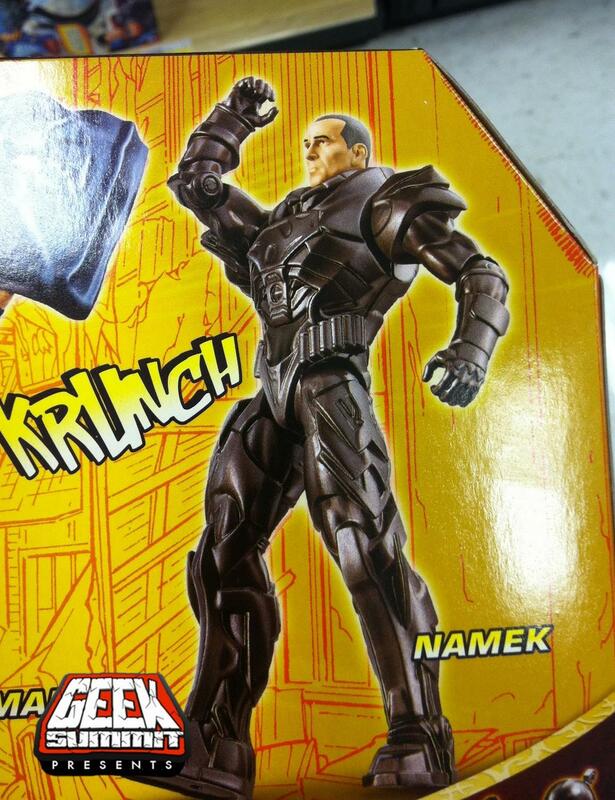 do i want marvel u type articulation sure but if this makes mattel money then i doubt i'll see it. I wont personally buy them, but they are great for what they need to be for kids. They are certainly up to par with what I was playing with when I was younger articulation-wise (except for GI Joe toys of course). Yeah, same here. Is he a comic character? I don't think he's from the comics. DC Wiki and Comic Vine certainly don't seem to mention him. The fact that he's a name so recognizable as a planet from a comic whose main character's origin is a bit similar to Supes' is kind of funny. Also want to know why he makes the rest of the characters look like pixies. EDIT: There was apparently, a "Nam-Ek" Kryptonian villain, who went under the super-threatening name of "Antibiotic Man". Doesn't sound like he's a super giant though.